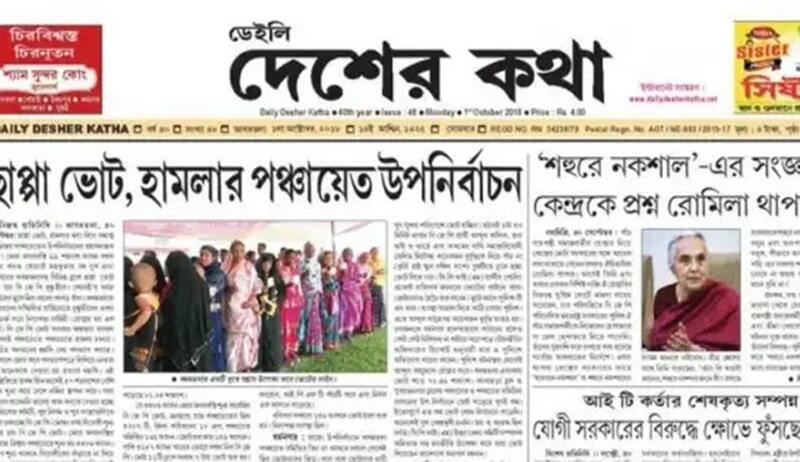 The Tripura High Court has stayed the cancellation of registration of newspaper "Daily Deshar Katha", which has been the mouthpiece of CPI(M) in Tripura for the last forty years. The registration under the Press and Registration of Books Act, 1867, was cancelled by the Registrar of Newspapers of India(RNI) following the recommendation made by the District Magistrate(DM), West Tripura on 1st October. The DM recommended cancellation on the ground of discrepancies in the declaration of ownership of paper. Challenging the cancellation, Daily Deshar Katha Trust, current owner of the paper, filed writ petition in the Tripura High Court. According to the petitioner,the newspaper was registered under the Act in 1979. CPI(M) Tripura State Committee was the owner then. In 2012, the ownership was changed to a newly formed society, Daily Deshar Katha Society. The original editor, Gautam Das, remained the editor even after change of ownership, and he was one of the office bearers of the Society as well. Das submitted a declaration before the DM regarding change of ownership in July 2012. It is the case of the newspaper that though the declaration was forwarded by the DM to the RNI, the RNI failed to act promptly on it. According to the petitioner, the newspaper bona fide proceeded on the basis of the declaration and accordingly changed the name of the owner and printing press and also the place of publication as per Section 3 of the Press and Registration of Books Act, 1867 to show in paper. In 2015, one Samir Paul took charge as Editor, and this change was also conveyed to the DM through declaration. It is contended in the petition that the RNI did not act on the declaration despite several reminders. In July 2018, the Society surrendered the proprietorship of the newspaper to the CPI(M) State Committee. Later, a trust- Daily Deshar Katha Trust- was formed, and was made the proprietor of the newspaper. This was also conveyed to the DM by the Editor. Meanwhile a complaint was filed before the DM by one Shyamal Devnath alleging discrepancies in the registration of the paper. The DM recommended cancellation of registration on ground that certified copies of declaration of the transfer of ownership from ‘Tripura State Committee of CPI(M)’ to Daily Deshar Katha Society", and later to the Trust were not produced. Challenging the cancellation, the petitioner contended that the RNI had failed to issue revised certificates despite several reminders regarding change of ownership. It was also contended that as per Section 5(9(2B)) of PRB Act, it is not necessary to have a proper conveyance/proper transfer of the ownership and authority, and a mere declaration is sufficient. The Advocate General opposed the petition stating that the impugned order of DM was appealable under Section 8C of the Act, and hence writ was not maintainable. The matter was considered by Chief Justice Ajay Rastogi, who admitted the petition and ordered stay of future effect and operation of the order of DM.